In light of some new information that has recently come our way, we have made corrections and updates to this story. Several years ago in India, I met a Nepali girl named Lakshmi. I was speaking to the leaders of her safehouse, reinforcing their brilliant and powerful dream of lifting tiny lives to dignity and wholeness, urging them to persist against incredible odds. They dreamed big for their land. Lakshmi was their first rescue from sexual slavery. She cowered in the corner, twitching and acting out bizarre behavior while I spoke. Having grown up in that culture, I knew their world, and I watched her from the corner of my eye. When I looked away from her, she stopped twitching and acted normal and attentive, shaking her head at the appropriate times—obviously understanding even the English—and acting “smart.” When I’d look at her, she’d twitch again. Smart girl! She’d learned that acting weird made customers leave her alone and helped her avoid abuse. When I saw her body language go from dead to alive and alert, I knew there was a thriver hiding in the wreckage. Beneath the brokenness was a very alert mind and a survival instinct. Sold by a family member, she had been taken from her homeland and trafficked to India. Abused repeatedly in a particularly vicious ceremony, she had a vehement fear of blood. We learned not to speak of “the blood of Christ.” Instead, we talked about the Lamb of God. She was fascinated with a God who loved her, stood in her stead and protected her from wrath. She had only ever known wrath. As she came alive, her relentless drive to share this God of love with others also came alive. Yet I also saw in her a grieving mommy. Soon after coming to India she had given birth to a son, then was sold to a faraway brothel while he was still quite young and had never seen him again. Though now flourishing, she was desperately lonely for her baby. The day I met her and saw her hollow eyes and broken mommy heart, I took Lakshmi on in my own heart. She knew I saw the mommy in her—something no one else in her life had seen. I bought her all the beads the market held, and we paid her to make baby bracelets in her son’s memory. Though she longed to find him and prayed for him daily, she eventually found peace in knowing that God was taking care of him. Her longing for her son grew into a deep desire that others come to know the SON. She used to go back to the red light districts to share her testimony of the God Who Changes Lives. After a few years, she decided to visit her family in Nepal to reconnect with them, forgive them, and share the gospel. Her sister chose to believe! On the day she was to return to India, she did not show up. Her family said she had died in her sleep. We sent a local non-profit to investigate and discovered that the police were also investigating. Her death was fraught with shadows and lies. All we know is this: she arrived in the village, professed that she no longer served a god that dripped blood, and declared the Lamb of God. She ended up dead. My partners grieved and held a memorial service, planting a tree in her memory in their garden. 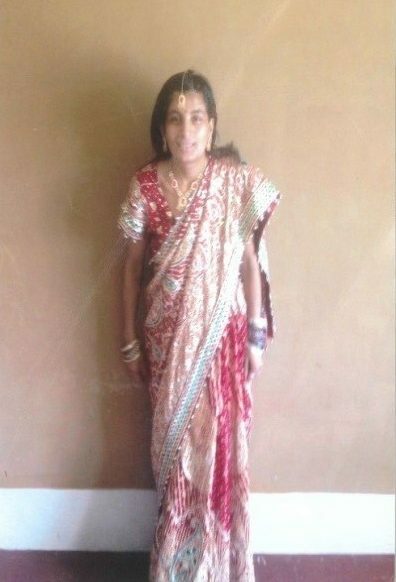 We later found out that Lakshmi had shared the gospel to the very end of her life. She chose to live the last days of her life sharing Jesus with those who sold her: her own family, whom she chose to forgive. When she knew she was about to die, she sold all her jewelry and used the money to buy samosas and sweets for the village children. The next day, in unspeakable pain, she lay down on her bed and, with her Bible on her chest, passed away into glory. I carry in my Bible a picture Lakshmi gave me of her dressed as a bride on the day she declared she was now a Daughter of the True and Living God. Safehouse staff had given her a brilliant red wedding sari, wedding makeup, jewelry, and a full party. She was so proud of her status as a Daughter of this God of Refuge. The village spoke of the fact that she would not back down on this God! It makes me wonder what really happened. God knows. Whatever happened, her death was not in vain. Those in her village saw how Lakshmi lived out her life and they, too, wanted to know the One who helped her to forgive. In a neighboring village, known for its traffickers, there had been a dormant church. Because of Lakshmi’s choice to live her last days sharing the gospel, this church is now growing in number, with members actively sharing their faith. I want a portion of the memorial garden slated for the front and side of our headquarters to be named the Lakshmi Memorial. We have 2000 patio tiles that make up the garden. We will raise $100 dollars per tile to finish the memorial garden in her name: a forever reminder of a Daughter of the King who died trying to tell others of the Lamb of God and the greatest rescue of all. The Memorial Garden will have a dozen stations where you can stop, meditate, pray, and reflect on the sorrow and JOY we address as the Family of WAR, Int’l. In honor of Lakshmi’s beloved son, there will be one stop in memory of children ripped from their moms, the Sweeties of life. Your gift will help make this place of healing, reflection, and memory a reality. 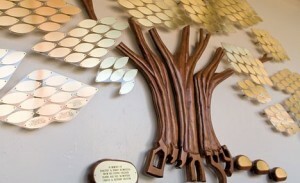 On a wall at Headquarters, there will be a Tree of Life with the donors’ names on leaves. It is fitting that Lakshmi in Indian lore is always connected to the Lotus flower that grows in muddy water rising to bloom above the darkness. Life began in a Garden (Eden), was restored in a Garden (Gethsemane), and will be returned to a Garden (the Garden City of Heaven).